Chances are, if you’re on a social network at work, it’s probably LinkedIn. Facebook is making major strides toward eating their lunch (I’m mulling a post on this in the near future) but for now, with a recently announced 17 million users, LinkedIn still rules the business networking roost. 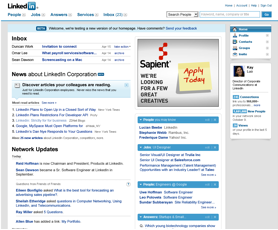 This morning LinkedIn announced a slew of new features and redesigns. Some changes are clearly aping Facebook’s success. Others are useful tweaks to their existing suite of networking tools. I’ll try to give a rundown of the new features after the break. Firstly, they’ve added what they are calling a dashboard. Taking a step toward personalized homepages like NetVibes, you can now customize the real estate on your LinkedIn homepage. Right now, you can only manage 3 “modules” by dragging and dropping. But I expect this to increase soon. Next, they’ve launched a newsfeed. This breaks down in two ways: firstly, each company grouping will receive a customized list of headlines that LinkedIn promises will be relevant to you and your industry; secondly you will get a list of links, based on what other people in your LinkedIn network clicked to read recently. This seems like a good way to keep tabs on the pulse of your business… if enough people use it. This feature comes straight from Facebook. Every time someone does something in your network, you receive a notification. This is the part I’m most excited about because it’s the one feature of Facebook I’ve found to be the most valuable for business purposes. It’s great to know what others are up to, in a completely passive but real-time way. Instead of seeing when someone got a Ninja-gram, I suspect the LinkedIn updates will feature items of more substance such as new contacts, job changes, conferences attended, etc. If they do this right, this one feature alone will turn me into a daily LinkedIn user. But of more interest to the geek crowd may be “InApps” (short for Intelligent Applications), LinkedIn’s answer to the myriad developer platforms that have emerged in the wake of the Facebook Platform. But InApps won’t bring food fights and zombies to LinkedIn, something that became clear early on when executives started hinting that the company would unveil a developer initiative. Rather, this will be a select group of productivity applications including internal widgets (a calendar of conferences, for example) and code for porting LinkedIn functions to external Web sites. The dream of course would be a suite of truly useful widgets, calendars, charts, spreadsheets, notification tools, etc, to spring up and make LinkedIn into the killer business platform we all dream of. We’ve got a whole generation of kids now who live their entire social lives within the Facebook platform. I would imagine that in their deepest fantasies, the folks at LinkedIn want to do the same thing. And they could… imagine if they integrated an online office suite like Zoho or partnered with Gmail? For right now, the main InApps app is a partnership with BusinessWeek. Now when you peruse BusinessWeek content, links will show you how various people, companies and products are connected to you in your network. Not a bad idea if more places picked this idea up. All in all, a bunch of really promising new features. But we won’t know how effective this all will be until we can see how many people start using these new tools. What do you say, readers? Impressive improvements? Are you seeing user uptake of these new features?